Located in the beautiful coastal town of Kennebunkport, White Barn Inn has been a beloved local landmark for over 150 years, synonymous with warm New England hospitality, rustic charm and uncompromising attention to detail. Just a 90 minutes’ drive north of Boston, this inviting property is renowned as one of the country’s most distinctive getaways. At the White Barn Restaurant, award-winning dining and expertly choreographed service unfold in a converted barn that is more than 150 years old. The days are longer, so leave work on Friday and escape to Maine's oceanside to toast the week's success stories. Kickoff your weekend as the lobstermen come ashore while the beach breeze meets your skin and enjoy a 30% discount for Friday night with a sunset cocktail, $100 food & beverage credit and breakfast for two daily. Your stay, your way. Receive a $100 per night resort credit to use as you wish. Whether it is dining on Maine’s bounty at our AAA Five Diamond, Forbes Five Star restaurant or enjoying a luxurious five-step hammam body ritual at our full-service spa, this special package allows you to enjoy the amenities that appeal to you most. Enjoy another romantic candle-lit meal, indulge in another massage, or take in another invigorating swim in our serene rock pool. Linger longer and give yourself more time to refresh and rejuvenate in our legendary Kennebunk hideaway. Book a night, and enjoy a full, hot breakfast on us. You know it will be a good day when it begins in our atmospheric dining room, situated in a nearly 200-year-old converted barn. From cooking right alongside our Chef in our renowned restaurant to enjoying a private cycling tour with our General Manager past miles of sweeping, sandy beaches and wooded trails lined with beautiful old hemlock, a world of unending pleasures await in coastal Maine. We have a little secret brewing in Maine. Beyond our buttery lobster rolls, steamy chowders, and pillowy blueberry pancakes, Portland harbors the third-highest concentration of craft breweries in America. Though we’ve been ranked as one of the top 20 beer cities by publications like Travel + Leisure thanks to beer pioneers like Shipyard and Allagash, there’s something we have that those other cities don’t. While you may find craft beers flavored with pecans, bourbon, or even frozen lemonade elsewhere, our taprooms entice small-batch ale connoisseurs with what we know best: sweet and silky maple syrup. When your love story takes you to Maine, whether to pop the question or to exchange vows, this coastal town is sure to sweep couple’s off their feet with warm hospitality and abundant local treasures. One of these such treasures, Coastal Jewelers, awaits just a three-minute drive from White Barn Inn. A best-kept secret that will make the romantic in you swoon, this jewelry shop offers the unique opportunity to take a piece of our beloved Kennebunk home with you. Step inside and find gorgeous adornments crafted from natural indigenous Tourmaline gemstones that are native to the town of Kennebunk. You might be surprised to learn that the origin story of whoopie pie, a beloved treat in New England, has been a source of great controversy between Maine and Pennsylvania for nearly a century. If you’re wondering how a dessert could cause such debate, let me stop you right there. Whoopie pie isn’t just any dessert. While couples tend to select their wedding date based on the weather, I always joke that they should be factoring in the types of seafood that will be in season during their special day in Kennebunk. 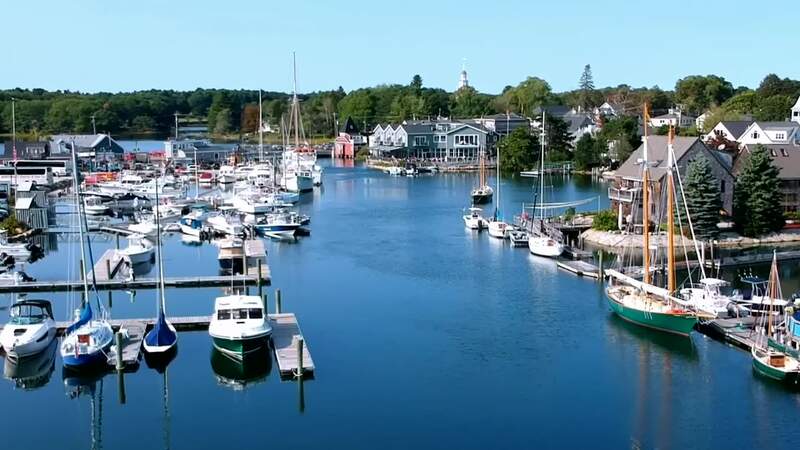 Historically a fishing village, Kennebunkport’s location along the Kennebunk River affords locals and visitors first pick of the freshest fare. Sea bass is best savored in the summer months, lobster is absolutely divine in the winter, and shrimp, oysters, and other types of shellfish are a must in the fall. A luxury that White Barn’s Forbes Five Star and AAA Five Diamonds restaurant delights in often— with a menu refreshed every week to incorporate the freshest fruits of the sea— make sure to ask the concierge to share the area’s boat schedules so that you can take full advantage of Maine’s ocean offerings, fresh out of the water.